Ease of use: The website and software have a mediocre standard of design which was okay but does not compare to the likes of Clear Books or Kashflow. There are an awful lot of options (57 menu items) so it does take a little bit of time to find your way around. Everything is reasonably well explained but there is definitely work that could be done. The nominal ledger has 304 nominal accounts in it! We thought this to be way over the top and an area for potential confusion. Part payments for customer/supplier invoices was not supported but rather a payment on account which would need to be matched later. We also noticed a bug whereby no invoices were found to match a payment against even though they were a day apart and the range ran for 6 months (which was the maximum for some reason!). The year-end routine in a cloud accounting software system should also be unnecessary as it reduces flexibility and is something else the user must think about. Some good and bad points in this category. Speed: The speed for entering transactions was pretty slow unless a bank import was used. Creating invoices was slow (doesn’t look like batch invoicing was available) and entering bank transactions involved a 2 step process or 3 steps if dealing with a customer/supplier payment. There was a further step if dealing with customer/supplier part payments which was frustrating. 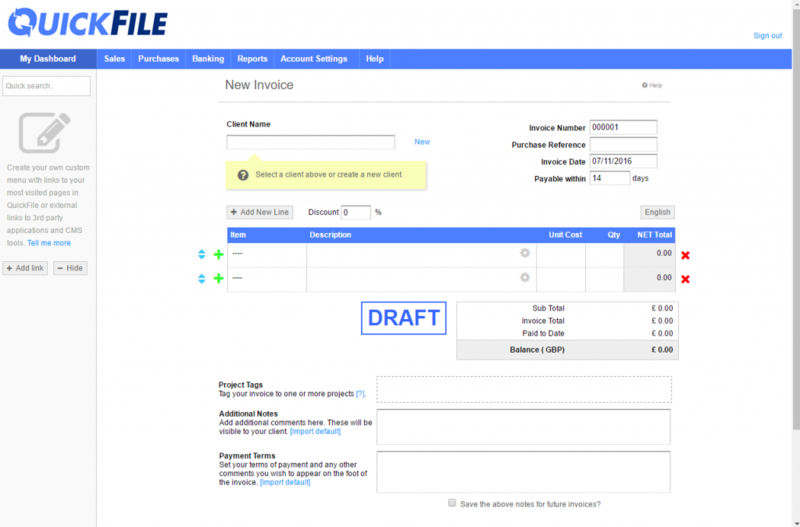 Features: Quickfile does offer a decent amount of features (all of which we did not test) including multi-currency, invoice styling, automated invoice reminders, PO handling, importing data, ability to upload receipts and integration with Dropbox and other service providers. Support: Does not seem that there is any telephone or email support available but instead a community network. Probably as it is offered for free. Reporting: There are a lot of reports (8 in total) and the ability to add customised reports (although limited). The reports in general do exactly what they say on the tin but they could be laid out in a more user friendly way. The VAT return is reasonable but you have to export the workings rather than just viewing them on screen. Price: Well, Quickfile is free so very good value for money! VAT Handling: Quickfile is made for the UK and does support cash accounting and the flat rate scheme. However it does not handle the switch between accruals and cash accounting which could catch a lot of people out! We also noticed that we registered for VAT within the accounting software, after a transaction had been entered and did not receive a warning of any kind. We thought this was a bit loose an open for potential errors. The bits we liked: The ability for customers to login and see their invoices was a nice feature that looked easy to set up. It also allowed for that area to be customised with logos etc. We also liked that accountants had an input into the development which meant that you could see a full nominal ledger which is missing from a lot of accounting software packages. The bits we didn’t like: Awkward methods such as the 2 or 3 step process for entering a transaction and the poor handling of part payments against invoices. This software has been developed with the input of accountants and you can tell. You would have to have some understanding and bookkeeping experience to ensure you’re producing accurate figures, it does take a little bit of getting used to also.